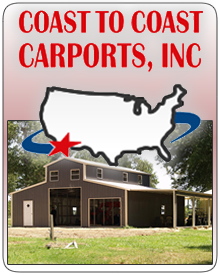 Thank you for choosing Coast to Coast Carports for all your metal building needs. Solid steel barn construction is what sets our products apart from the rest. As one of the top metal building experts in the country, we specialize in structures that meet the needs of commercial, industrial, and residential customers alike. We have both pre-fabricated and custom made buildings available. Our products are designed with our customers and usability in mind. Once you purchase a metal building from us, you will see for yourself what fine craftsmanship and quality go in to our products. With numerous options, styles, and designs; we are certain to have the perfect metal building for you. Our structures are built using the latest and most dependable in steel barn construction technology. This makes them perfect for livestock safekeeping, equipment protection, storage, and multiple other farming needs. Whether you are in need of a separate building or looking for one that attaches to a current structure, we have a wide variety of building solutions available. Our products are also great for those looking to expand current operations or for those attempting to downsize. Whatever it takes, we are dedicated to helping you find the ideal steel structure for your individual situation. 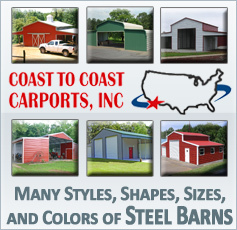 For many years now, Coast to Coast has designed metal buildings using only the finest of steel barn construction methods when it comes to steel barn homes. We know what our customers want and we are committed to delivering products that are functional, strong, accommodating, and visually appealing. Please take advantage of our professional team of customer service agents who will help you to compare building layouts, features, and answer any questions you may have. Coast to Coast’s reputation for outstanding products and service wasn’t just born overnight. We have spent many years carefully planning and developing products that are constructed using the quality craftsmanship that you deserve. From the panels, to the steel, to the roofing; we make sure that our metal buildings are reliable, solid, and secure. Please be sure to check out our promotional page for the special discounts and deals available in your area.